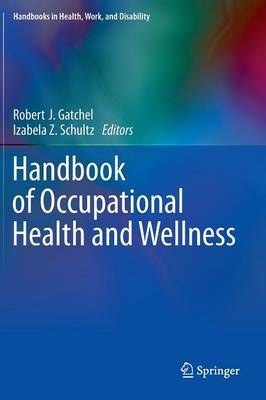 This book integrates the growing clinical research evidence related to the emerging transdisciplinary field of occupational health and wellness. It includes a wide range of important topics, ranging from current conceptual approaches to health and wellness in the workplace, to common problems in the workplace such as presenteeism/abstenteeism, common illnesses, job-related burnout, to prevention and intervention methods. It consists of five major parts. Part I, "Introduction and Overviews," provides an overview and critical evaluation of the emerging conceptual models that are currently driving the clinical research and practices in the field. This serves as the initial platform to help better understand the subsequent topics to be discussed. Part II, "Major Occupational Symptoms and Disorders," exposes the reader to the types of critical occupational health risks that have been well documented, as well as the financial and productivity losses associated with them. In Part III, "Evaluation of Occupational Causes and Risks to Workers' Health," a comprehensive evaluation of these risks and causes of such occupational health threats is provided. This leads to Part IV, "Prevention and Intervention Methods," which delineates methods to prevent or intervene with these potential occupational health issues. Part V, "Research, Evaluation, Diversity and Practice," concludes the book with the review of epidemiological, measurement, diversity, policy, and practice issues-with guidelines on changes that are needed to decrease the economic and health care impact of illnesses in the workplace, and recommendations for future. All chapters provide a balance among theoretical models, current best-practice guidelines, and evidence-based documentation of such models and guidelines. The contributors were carefully selected for their unique knowledge, as well as their ability to meaningfully present this information in a comprehensive manner. As such, this Handbook is of great interest and use to health care and rehabilitation professionals, management and human resource personnel, researchers and academicians alike.